Step 2. A username for IRC. Step 3. Connecting to the DGPLUG channel. Internet Relay Chat (IRC) is an application protocol to do text based communication. It was created in 1988 and still being used as one of the primary communication medium for many people around the world, including various Free and Open Source software projects. 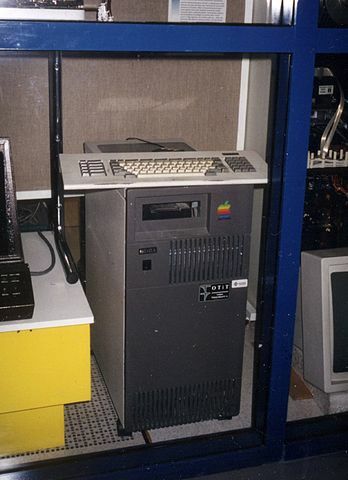 The above is the first ever IRC server (original image is from Wikimedia Commons). We use IRC as our primary communication medium because it works with low bandwidth. You don’t need super fast internet connection to attend the summer training sessions. Also, later when you will try to contact other communities, you will find most of them are active on IRC. Every IRC server has various virtual groups or rooms where people can communicate with each other. These are known as channels. The channel names start with # sign. For example, #dgplug is the channel name in Freenode server for our training. There are various IRC clients, for our sessions you can use hexchat client on your computer. hexchat is a popular Internet Relay Chat (IRC) client. It has a choice of a tabbed document interface or tree interface, support for multiple servers and is highly configurable. For windows please download hexchat from their site. Default hexchat will open in network selection window where you have to select FreeNode and then connect. After pressing OK, you are now in main window and joined #dgplug channel. Now you have register your nickname to make sure someone else not using it. You will get a verification mail for your registration and same you have to execute in XChat window. Below is a GIF which shows how to join the #dgplug channel on Freenode. While a client (xchat, hexchat, etc), on any platform, is the best way to experience IRC on a daily basis, you can in fact use your web browser to connect to IRC! While it might not be as comfortable as a native client, irc via a browser is actually quite full featured. It depends on you knowing commands though, so this page on the IRC beginner website will come in real handy. Here’s what we’d need for our summer sessions. Login with the username you want, like I’ve done here. I’ve chosen mariojason for a username. Ignore the channel and auth options for now. Just clear the I am not a robot test. And you should enter the world of irc! There’ll be a lot of stuff that’ll end with a screen like this. You’ll obviously have figured out that the little white box at the bottom is where you type in your messages and commands. You can type /quit to quit your connection for example. Also note the tab that says “status” (not visible in the pic) above at the top of your window. You’ll want to click this tab before typing in sensitive IRC commands (as you will do shortly). You’ll see more tabs at the top as you join channels later and you’ll use the tabs to switch between them. You in with your username? Good. Now let’s register it so that we can always have the same one. So hop over and check your mail. This is what you should expect to see. And voila! You should be verified! Now we’re back to where we started. Only this time, fill in all the details. Fill in the complicated password that you had created for your id. You should login and you should be switched to a new tab with the #dgplug channel.